Mostly clear. Low 51F. Winds light and variable.. I was happy to see the recent letter to the editor from Nikki Mead Cummings, thanking the Benz family for more than three decades of contributions to our community. I have been involved in a variety of charitable projects over the years, and when I asked the Benz family for assistance, they never said "No." Not once. We live in a free (freeish) society, and private businesses are not required by law to support nonprofit groups, charities, community improvement projects, etc. The fact that the Benz family has chosen to do so, over and over and over, for many years has earned them the gratitude and admiration of many of us in the Tehachapi community. I would also like to express my respect and appreciation for employees of the Benz family of companies, who have been key to the success of those businesses. 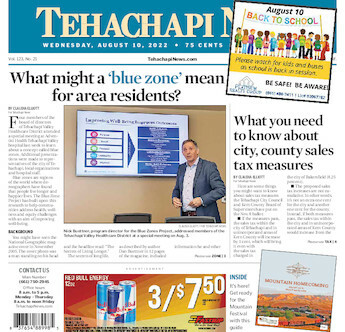 These employees, some of whom have worked for the Benz companies for many years, like Bill Sasnet, Larry Christie, William Sasnet, Phil Gatica, Don McAfee, and lots of others are competent, hard-working Tehachapi people who have made the Benz operation effective and professional. As a society, we don't give enough credit to those who work with their hands and their backs to keep our towns, cities and outlying areas functional. There's not much glamour working in fields associated with household trash, construction waste, septic and sanitation services or propane delivery, but these are vital tasks. The men and women who perform these demanding and at times potentially dangerous jobs deserve respect and dignity. They are willing to get dirty so that our lives can be cleaner. I am proud to know them, and thankful for them and their honest labor.